while our thoughts go to Thanksgiving on one day in November, the Lemurians live each day as a celebration of life, of love and gratitude for the limitless bounty, beauty and grace they enjoy everyday. While they live in peace and harmony with each other, it is important for us to know that they also live in complete harmony with the Powers of Nature and the Forces of the Elements, even to the extent that animals that are carnivorous in our reality are vegetarian in Telos. because they know that all life is interconnected, that in Truth there is only one Life individualized in and as each of us whether we speak Lemurian, French, Arabic, Hebrew, Spanish or English. Traditionally Fall in the Northern Hemisphere is when farmers put their gardens and fields to bed and store the bounty they have reaped from the seeds sown in the Spring. The Fall Equinox is a normal and natural occurrence dictated by our planet’s annual journey around the sun. What is not normal this autumn is the ferocity and devastation of the tropical storms with their horrific winds and disastrous flooding, not to mention the uncontrolled fires that have swept through Canada, Northern California, Oregon and Washington. The hurricanes we’re experiencing defy science. Weather specialists cannot explain the differences in the patterns and intensity of these storms, relative to the “normal” storms of previous years. As one example, rather than random occurrences, these storms are coming in series of four, one hitting after the other. In addition, instead of diminishing in intensity to force 1 or less when passing over land, they have gained strength and sustained winds of force 3 or greater. Why is this happening? We can take a hint from our friends in Telos. Having destroyed two continents, the Lemurians and Atlanteans learned the hard way the consequences of misusing the Powers of Nature and the Elemental Kingdoms. They know that the Elements respond to them, to their thoughts, feelings, and their actions; in short to their consciousness. Using that wisdom constructively is how the people in Telos have created their paradise inside the mountain. A wonderful illustration of this can be found in the book, “Telos Volume 1, Revelations of the New Lemuria..” In Part Two of that book is a fascinating description of how they construct their crystalline homes by means of their intention, attention, visualization, and concentrated focus. The Elemental Kingdom responds to them and essentially precipitates the physical form corresponding to their vision. That elements respond to us was dramatically illustrated by the late Dr. Masaru Emoto who discovered that crystals formed in frozen water reveal changes when specific, concentrated thoughts, words or images were directed towards the water. He found that water from clear springs and water that has been exposed to loving words shows brilliant, complex and colorful snowflake patterns. In contrast, polluted water, or water exposed to negative thoughts form incomplete, asymmetrical patterns with dull colors. The implications of his work created a new awareness of how we can positively impact our environment, the Powers of Nature and our personal health. In his appropriately named book, “The Hidden Messages in Water,” he shares incredible images of some of the frozen crystals of water and his conclusion that the message of water is love and gratitude, the very qualities that permeate all aspects of life in Telos. The question before us now is how much more will we have to suffer from the destruction wrought by the Powers of Nature and the Forces of the Elements before we begin to connect the dots and recognize that the seeds we’ve sown with fear, worry, racism, prejudice, judgement, selfishness, misogyny, hatred, divisiveness, xenophobia, denial and spiritual and scientific ignorance have given birth to violent displays of the Powers of Nature. To worsen the situation, many of the safeguards we used to have to protect the environment have been removed since the first of the year. The Washington Post recently made a list of those now deceased safeguards and can be seen by an internet search for “WP Undone.” No doubt the Lemurians and Atlanteans are also wondering how long before we let go of our dance with the duality of good and evil and turn to the polarity of Light and Love that defines their lives and allowed them to reclaim their immortality. For those of us who are connecting the dots and recognizing the human factor behind the chaos, discord and violent displays of Mother Nature that get played over and over by the media, it is imperative we do what we can to stay in our hearts as much as possible, keep out of fear and do as Gandhi said and “be the peace we want to see in the world.” While we are evolving through these opening years of the 7th Golden Age it is heartening to know that inside Mount Shasta our Lemurian brothers and sisters are quietly living our future as spiritually enlightened and ascended beings. Would that we could push a magic button that would instantly enlighten the minds and hearts of those serving in Congress with the wisdom of Telos. How different our country and world would be. Click here for YOUtube Channel contemplation videos! Telos Conference Call every Saturday. 1-712-432-3100; Code: 445613. Marie Philips and Sue Parry invite you to join them along with many people from around the world to listen to messages and contemplations from Adama and the Masters. Click here for times and more information. This special ceremony is approximately 30 to 40 minutes. Click here for times and more information. If you would like your Study Group or Ascension Ceremonies listed on the calendar page of our website, please contact us: info@telos-usa.com. In case you missed our Solstice Newsletter…. The holiday season is about family and gatherings. It’s about singing carols and gift-giving. But most of all, it’s about love; love of family, love of friends, love of humanity. It is a charitable time of year. Master Adama says that in Telos there are many celebrations, but their main festivities are centered around the seasons and solstices. Everyone, including the children, participates. They decorate the city with imaginative and elaborate decorations. The festivities last for three days, and people from all over Inner Earth take part. Family and friends join their loved ones for these grand and festive times together. During this Winter Solstice, imagine yourself receiving a beautiful invitation from your family in Telos. You are so excited to attend, for this is your first formal visit. You follow the explicitinstructionsfortravelingtoTelos, and are met at the entrance by your loved ones. The love and blessings that surround your aura are breathtaking! You have never felt such peace. Divine unity runs through everything. It personifies itself through us, its people.Fifth dimensional consciousness resides at the very center of our souls. It has the ability to promote tranquility around the world through us. This reality is positive and strong. It is the same as in every living thing on our beloved planet, but we are the key to its success. So today, and always, fill your world with love, joy, and peace. Let harmony govern your thoughts and speech.Tomorrowawaken in contentment, living in a consciousness of good. By raising our own vibrations and walking in the footsteps of grace, we will bring peace to our world, and stand next to our friends in Telos. An EXCERPT from the channeling presented by Denise Laberge on July 19, 2016, in la Molina, Spain. The energy of love is an energy that supports life and the expansion of life. We could even say that it is life in action. Very few children of God can define or even have an idea of what life is. When you ask this question to a human, he will always reply by using words that describe an action in his own world. For example: the plant that grows, the wind in the trees, a smile on a face, the song of birds; or even love, courage. In fact, all these words describe realities based on feelings from his personal observations, etc. This definition is valid because life and love are interrelated. All these words and expressions are also part of life. However, each individual describes life according to his own evolution, his understanding of himself and his world. The Love-light is alive and active when it is transmitted with intention and will. When you transmit it in consciousness in order to communicate with an object or a situation, your consciousness encompasses this object or situation and it is now part of your consciousness and you become one. You are always your own consciousness, but you have widened the action field of your consciousness to include and come into contact with an external energy that can be near or further away. This is done in order to come into contact with yourself, your individual consciousness. Love-light is a way to get acquainted with the universe and to become known by another part/person/being in the Universe. It is the heart that makes contact with another heart and that allows the contact, the understanding, the exchange. Your energetic signature is in this love-light, which is the reflection of who you are in all your aspects. It is the fusion of the life energies that come into contact and learn. The more a being elevates himself spiritually (in consciousness), the more he can include a greater world in his consciousness. The less a being is awake, spiritually speaking, the more his consciousness is “glued” to himself. He cannot encompass in his perceptions all that is around or external to him. The consciousness of Mother Earth includes her whole body, the bodies of its inhabitants, and even more. To make a true contact with another person, make it a habit to surround the person with your love-light and you will see a considerable difference in the behaviour of people. Everyone feels what a person transmits to someone else, either consciously or not. The person does not know this consciously, but the soul feels it. The Flames represent a frequency of love-light, as love always favours the blossoming of consciousness, of life, and of all that is in balance. A quality is an energy frequency that is in harmony. A non-quality is an energy frequency out of balance. Love is a frequency always in balance and so all that is in its field of action finds itself in the same balance, which consequently creates beauty and harmony.What is in unbalance cannot create beauty. In balance, the forces of structure, order, expansion and change create harmony allowing the expansion of life, the creation of forms, etc. Love-light is an energy that is active and alive, it is not stagnant. Each week Adama, Aurelia, Ahnahmar, the Elders of Telos, the Chohans of the seven rays, Angelic realm, Emissaries of Light, and Ancient ones of the Mu ship offer their guidance through the offering of tools, allowing the heart to bring forth the vibration of Love to all. Marie Phillips and Sue Parry look forward to sharing the guidance, energy and vibration with all who join us on the call. We ask that each person as guided on the call have a Grounding stone, or crystal with them. We are all surrounded with such high vibrations on the call that it is beneficial to stay grounded so we can be present to receive all the Blessings and Pearls of Wisdom being given to us. If you would like your Study Group or Ascension Ceremonies listed on the front page of our website, please contact us. Also check our Contacts Page. Click on Study Group/Ascension Ceremonies for locations. We wish you a Blessed and Peaceful Holiday Season and Happy New Year 2017! Greetings, I am Adama. I greet you from the heart of Telos and the heart of Lemuria. Many of us are here today to express our gratitude to you for the work that you have done to help make the ascension possible. Without you this could not have been accomplished. You are a treasure to us and to the Earth. You have made many bold steps in this incarnation. You have learned a lot and have grown spiritually in a magnificent way. Your rewards will be many. Think of yourselves as a blossoming rose. Each petal of the rose represents a metal of courage as you lived your lives on the Earth. The rose represents love and you have plenty of that. Do you know that we have lovely gardens here in Telos? We plant flowers to celebrate our successes as well as yours. These plants are tended with loving care. They capture the Light and love of creation and are a constant reminder of the beauty of our lives in Telos. We hold that Light and love for you on the surface the Earth. Because we are fifth dimensional beings and greater, we can truly say that with the 12/12/12 energies and the 12/21/12 energies we have made a leap in our consciousness too. Can you feel the expanded Light that is coming from us to you? We can give you more as you transcend the third dimension. We see your luminescence as you can perhaps feel and see ours. What is most important is that you begin to notice this within yourselves. Recognize each other as the Light Beings that you are and keep expanding in the Light. The higher your vibrations become the closer we are to being able to be with you. We have long waited this time of reunion. For the majority of humanity the fear level is still too high for us to make a wide announcement of our presence. For those reading these words we know it is otherwise. We continue to wait for the wider opening in consciousness for us to be in your presence. Our work with the Masters like Christ, St.Germain and Maitreya continues constantly. We are monitoring your progress and planning for future predicaments that may arise. We are your back up team and we are at your service. There is a Master Plan that we know is divine. It encompasses all aspects of life on the Earth. Regardless of what happens if you have faith and trust in the plan you will always succeed. You can expect more earth changes in this year of 2013. The Earth is unstable. Everything is being done to keep her propped up. The coastal areas are wide open for shifts. The Earth changes are in everyone’s back yards. The Earth continues to need her cleansing. She wants to protect her children and much is being done with the nature spirits, elementals, space family and others to do what can be done. This is about consciousness raising not the destruction of the Earth. You can continue to expect volatility around the planet. Pay attention to your hearts. Watch the animals’ behaviors. Pray for divine balance for as above so below. This will affect everyone in every dimension including us in the Earth. There will be some earthquakes of great magnitude, fires, drought, volcanoes and large water events. It always helps to be prepared in every way possible. Bless those in the affected areas for they will need your love and support. The Earth is a magnimous soul. Her love is beyond description. Her patience with humans is amazing. In this year you will discover more of your gifts and will be called to use them. Everyone is being pressed to be their authentic self. You will find the principle of resonance actively working so that those of like vibration will be drawn together in love and service. Community will take precedence. Because you are in the now moment and time is no longer a linear construct, your manifesting abilities will surprise you so watch your thoughts. Keep them positive and whole. The love and Light present on the Earth is a gift from our Creator and is a result of the work that has been done by the Lightworkers. You are beginning to feel and live in the higher dimensions. It will be a gradual shift into the Christ conscious that we have been holding for these many years. Please call upon your Lemurian family for love, inspiration, and healing. Let us send you the Lemurian reminders of how far you have progressed and the healing heart energies. They will carry you a long way. The path of ascension is not always a smoothe one. There are leaps and bumps. Sometimes it is challenging to release attachments of what life has been like in the third dimension in favor of the unknown. Please be assured that our Creator knows your needs, loves you unceasingly, and will make your lives better than you could ever have imagined. We have the utmost faith in you for your ability to transform your lives and the Earth. Your progress is exponential. We stand in unity for the upliftment of all. We send our most gracious love to you. I am Adama. We have not yet understood that the animal kingdom is here to share the earth with humans “equally,” that they have as much right to live their existence in peace here as we do without being subjugated by us. Animals have been ordained to be here by the “Creator” for very specific reasons, many of them for our benefit; but the earth was meant to be shared with them in a brotherly and loving partnership, not ownership. After millions of years of evolution we still have not understood who the animals on this planet are and what they are about. We still think that besides using them for food and “profit” / “benefits”, they have no other purposes. We have no concept that they are our younger brothers and sisters on the ladder of evolution and this concept still offends the narrow minds. Animals are a different expression of the Creator but nevertheless another facet of God’s Love and they have a right to share the earth “equally” as cohabitants. They are also the beloved “children” of the “Earth Mother”; they represent one of her many kingdoms and ultimately, they belong to her. They are loved and nurtured by Her equally. We have not yet understood that we need them as much as they need us, they are our friends not our slaves. Just because they are different, it does not mean that they are inferior or less important than we. How overbearing are we towards the animal kingdom! We have no right to “own” them for our selfish purposes and dispose of them without gratitude for services rendered. A civilization is judged by the way the people treat their animals. It does not say much for us surface humans, for the way we have been treating our animals on this planet. We butcher them for food, we enslave them, cage them, chain them, experiment on them, destroy their habitats for the purposes of building more houses, more shopping centers, more of this and more of that. We want more and more for ourselves, always “needing” more because we are still looking “outside of ourselves” for true fulfillment and to have all of our “needs” supplied. We have not believed the words of Christ when He told us that the “Kingdom,” All That Is, The Door of Everything is Within Us. The Inner Earth Beings know everything in detail about all of our doings here on the surface. They monitor us very, very carefully with technology we cannot begin to dream about. They are waiting for us to “mature” before they can come to the surface and teach us. Our negativity and way of life is not enticing to them. They are very much looking forward to the day they can merge with us again. But they are waiting for us to become “more civilized” among ourselves and have more respect for the ecology of the earth and Mother Earth Herself. As a matter of fact, the Inner Earth people are beings of such magnitude and love and are so much more advanced than we are spiritually and in every way, that we stand like “toddlers” in front of them. If they came here openly now to help us out and teach us their ways of brotherhood, they would be killed very quickly by the “powers that be.” It has happened before. Around 1947, I am not sure of the exact date, the U.S. military had attempted to invade the city of Telos under Mt. Shasta with machine guns and their war equipment. What do you think their intentions were? The Telosians have not since been permitted by the Galactic Federation Council of Twelve to mix with us, surface people, and they have to abide by those rules. They used to be seen around the Mt. Shasta area at the beginning of the century but they are seen no more. It is my understanding that they make very few exceptions and for good reasons. It is really up to us if we want the benefit of their love and company among us, to grow and mature and make ourselves “worthy” and “deserving” of their presence. In comparison, we can think of them like university professors looking at “toddlers” that would want to learn from them. Until we master the art of true living and honor the earth and the sanctity of life, we could not begin to understand and be able to accept their ways. We are not ready as a race to receive them and they know this. Of course, many of us are exceptions to this and it is with much longing and great anticipation that we are waiting for their appearance among us. The mass consciousness here on the planet is still living in fear and the consciousness of “enemies” and may not be able to accept them at this time. There are the few of us who are ready and we are the ones preparing the way for their coming. We are the way showers. Until we stop our “violence” towards “ALL” facets of life, and begin to live the way of harmlessness, they consider us “violent” and they will not come. We still fish and hunt big time, not for necessities but as a “sport.” How unaware and backward can humanity still be, in 1999, one year before the new millennium and 2,000 years after the coming of Christ who came to teach God’s way of love and non violence. There are still many killing animals for the “pure sport” of it without any consideration or thought for their lives and their destiny and their reasons for being. They buy hunting tags or fishing licenses from government agencies to get licenses to “kill” other life forms of the children of the Earth Mother. We choose to ignore that she is not supporting only the evolution of “humanoids” on this planet; the animals are just as dear to her heart, they are also her beloved children. Without the Earth Mother, we would have no platform for evolution, as she is hosting us and the animals, “equally.” She has tolerated with love and endless patience for hundreds of thousands of years our abuse of her “body” and her “kingdoms” We think we “own” everything here without being accountable, and we can just use it and trash it as if there is no tomorrow.Actually, we are the “steward” of the earth and we will be judged by the quality of our stewardship and be totally accountable. It is our initiation! When we cease our trashing of the “earth” and its inhabitants, and cease our violence and move into “harmlessness,” we will see the Inner Earth people emerge from within and greet us with love and show us a better way of life. They will teach us how to build a Golden Age of Love, Prosperity for all and Eternal Peace. It is up to us to prepare, to open the way for their coming. They have been waiting for us to get out of our “diapers” so to speak much too long. Although the vast majority of Inner Earth beings or subterranean cities are Cities of Great Light, there are unfortunately a few places inside the earth that are places and cities of darkness and inhabited by the sinister forces and not desirable by any means. These people are not the “real” Inner Earth people. Many are the people from our Secret World Government, military bases and other civilizations of darkness that have fled there in the last 100 years or more and some longer because all their other attempts to escape the earth “safely” have failed. Because of their darkness, they have discovered to their great dismay that they will soon have nowhere else to go but face their accountability. Their attempts to move to the moon have failed. They discovered that the moon is inhabited by other civilizations and that they were not welcome. Have they told us that? This is secret information that is gradually seeping out. The secret government has and are now building cities and colonies inside the earth that are usually not very far from the surface for their coming and going. Have you heard of “Alternative 3″? Alternative 1 has failed, Alternative 2 has failed and Alternative 3 has failed. It was so scary for the members of the secret government to see the plans of escape, that they have prepared for hundreds of years fail 3 times, that they are now working on “Noah’s Ark Project and this is “underground.” I beg you not to try to find them or approach them because you would not live very long or would be taken as a prisoner to be treated as a slave to do their dirty work. But these are not the “Inner Earth” people we are talking about, they are our present Secret World Government, One World Government Order, Military Alliances, and “surface people” who are trying to plan their escape when the Light of Almighty God will finally shine on this planet. “They know” now they will have nowhere to go, nowhere to escape; and neither will you if you are not “now” choosing to live the way of harmlessness and love. Mother Earth herself has revealed in a channeled message that when those days will come, she will find a way of evacuating those people as well. Those not serving the Light of Almighty God will no longer be tolerated on this planet. Yes, the real “Inner Earth” people are beings that we can trust and who love us very dearly and see us in the light of true brotherhood. But beware of the other kind, of the sinister force. This is where discernment becomes important. Be at peace, for the days of the sinister force encampment inside the earth is now “numbered.” It is my sincere hope that within 10 years from now and perhaps sooner, we will see our Brothers and Sisters from inside the earth, emerge to the surface by the thousands, coming to help us out in a time of much distress and transition. I ask all of you reading this material to rejoice for those days, and to prepare to welcome them into your heart and home. Can you imagine the great joyous event when the two main civilizations of this planet, the ones from the inner core and the surface people, reunite in love and brotherhood after thousands upon thousands of years of separation? Can you imagine the wonderful “party”? It will be so divine, the whole universe will watch. And for us, it will bring our liberation! Alleluia! A while ago, I was asked to describe, as well as I could, some of the reasons the people of the Inner Earth, or the various civilizations living in the hundreds of underground cities have chosen to live in this manner, and still choose it to this day. Over twelve thousand years ago, when the continent of Lemuria sank beneath the waves of the Pacific Ocean, about 25,000 Lemurians, part of those who escaped and survived, went to live underground, underneath Mt. 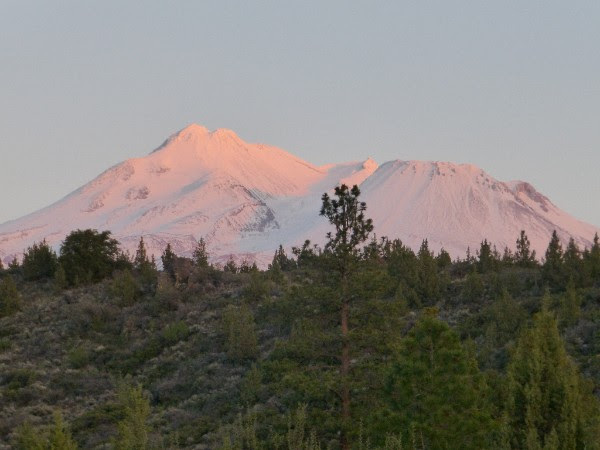 Shasta, to the city they named Telos. The project of building this underground city was started several centuries prior to the sinking of the continent. The Lemurians and the Atlanteans knew for a few thousands of years ahead that their continents were doomed to eventually sink, and they painfully prepared for it. Telos was prepared to save 200,000 people but only 25,000 actually made it on time to the underground city before the land sank underneath the waves. At the time, this was a very painful and challenging direction they chose to make for the sake of saving their lives, saving most ancient records and treasures, and be able to continue their evolution peacefully, without the burden of the tremendous negativity and wars that were destroying the surface of the planet and its people. After the sinking of Lemuria, and then Atlantis, a few hundred years later, the shock to the planet was so great, that the Earth shook for almost two thousand years. For 300 hundred years, the debris floating around the planet was so dense, that it greatly dimmed the light of the sun to the point that it became very cold on the planet. Plant and animal life became rather scarce, and the growing of food very difficult. Life on Earth became almost unbearable for the longest time, and so difficult, that a large population of people who remained on the surface eventually died. For 200 years, earthquakes were constantly so violent, that large segments of the surface liquefied as clay, and formed a sea of mud, engulfing whole cities overnight, all over the planet. Tidal waves were so large that they went as far as 1,000 miles inland, destroying everything in their way. The cities that were not engulfed by the sea of mud or by the tidal waves, eventually shook to rubble by centuries of constant shaking. Hunger and diseases were rampant everywhere. There are places that survived, yes, like Egypt for example, because they were aware that these cataclysms were going to happen, and they had the wisdom to start building their cities accordingly ahead of time. But for most, it was the desolation of almost total destruction in most areas on the planet. It was easier at the time to live underground than it was to try to make it on the surface. Those who went underground, the survivors of these cataclysms, were able to gradually, little by little, develop a way of life underground that was far superior and wondrous than what surface people were subjected to. At the time, various bands of marauding extraterrestrials came to dominate and prey on the people of Earth who were struggling to survive as peacefully as they could. The extraterrestrials were not the only ones who caused a lot of negativity on this planet. The majority of the people of Earth themselves had fallen into a very low level of spiritual denial. They were also warring and preying viciously among themselves. Love, compassion and true brotherhood had become something of the past, forgotten by most people of Earth´s population. Mankind, in many areas, regressed to the level of cavemen and warring savages. Ever since, people of Earth have never stop completely warring against each other. There has been eras of peace and love, but they never lasted very long. There were always those who came to disturb it, and put an end to it through attacks and destruction. Even today, at the very dawn of a new permanent golden age on this planet, there are many who still live in the consciousness of fear, violence, enemies, control of others, manipulation, wars, intolerance, taxation imposition, deception, greed, etc. One needs only read a newspaper or watch the news to relate to what I am writing about here. Those of the Lemurians who were committed to their spiritual evolution, and who desired to remain faithful to their heritage of peace, love and brotherhood found it easier to live underground than to be subjected to the harshness that existed on the surface. It is that simple of an explanation.It was not only harshness of the weather that made life difficult on the surface, but also the harshness of how humanity had come to treat each other. I am sure there must have been a long period of adaptation for those who went underground to live. One must understand that it was out of necessity, rather than an enjoyable choice that originally forced the Lemurians and other underground dwellers to select to live inside the Earth. By doing so, they also joined and received some assistance from those beings from the Inner Earth who had been living underground for much longer periods time; for some, hundreds of thousands of years, who had vacated the surface to live underground for very similar reasons in other eras of Earth´s history. Following the sinking of the continents, people of Earth did not learn their lessons well, and many continued in their ways of darkness, greed, control and warring. When the continent of Atlantis sank under the waves of the Atlantic ocean, it is my understanding that the disturbances caused to the body of the Earth was even greater than the disturbances caused by the sinking of Lemuria. The story of “Great Flood” that the bible talks about is really one of the phases we know of the sinking of Atlantis. Life underground had much more security, stability and peace to offer then than life on the surface. Until today, this fact has remained the same. We, on the surface, are still living in duality, and the Inner Earth people have evolved to a level that we can hardly conceive with our human mind. The underground population, in general, has reached such a high degree of spiritual development that they have truly reached an ascended master consciousness, and our ways of life on the surface is not at all enticing to them. I can venture to say that they want to have nothing to do with the way we live. To them, it is too primitive! They have learned the total mastery of energy in every aspect of their lives. They have conquered the decay of disease and death by succeeding to immortalize their physical bodies. They can maintain youthful bodies for thousands upon thousands of years without any sign of aging. They control their weather by their constant harmonious thoughts. Erratic weather patterns on the surface are caused by nothing else than the erratic emotional patterns of the people on the surface. I don´t care what our scientists tell us, the elements of nature manifested by weather patterns, pleasant or not, is another facet of Life that mirrors mankind´s proper use or misuse of energy. If we want to control the weather to our advantage, there is only one way! As a race, we need to learn to control our thoughts, our emotions and practice unconditional love towards every particle of life on this planet. The day we learn to keep our thoughts and emotions on the vibration of Love, Light, Joy and Brotherhood, we will assure for ourselves perfect weather without the need of interference from our manipulative governments. The “underground” people have understood this principle a long time ago. In the subterranean cities, since everyone lives their lives only to the precepts of Love and true Brotherhood, they enjoy perfect weather every day of their lives. The weather remains for them like a constant spring, an even temperature of around 70 to 75 degrees all year round. We need to start perceiving that the kind of weather we are getting on this planet, as a barometer of the thoughts and emotions the mass consciousness holds. The extreme hot and cold weathers are very good indicators of the extreme negative thoughts and feelings of humanity in general. When all of humanity returns to the ways of love, we will create the kind of balanced weather we want. The weather on this planet, controlled by the elements of nature, represents nothing more than a giant mirror of the emotions and thought forms of the people living here. In the subterranean cities, there are those who have evolved to a fifth dimension consciousness and those who have evolved to a fourth dimension consciousness, while retaining an immortalized body that is totally free of the human limitations we are still subjected to on the surface. All of them live in a kind of wondrous paradise they have forged for themselves over the thousands of years they have lived underground. Our ways of life here is very far remote from theirs. They consider us still very primitive in our ways of living, we way we structure of our societies, our governments, our legal system, our educational system and our healing modalities with the cut, burn, and poison system, etc. Comparing to them, we, on the surface, are like toddlers still in diapers or savages in the jungle. They do not judge us, they still see us as their brothers and sisters; but they are certainly not interested to partake our ways of life. When we are ready to listen to them, accept them as our teachers without killing them, when we are ready to integrate their ways of life, they will come out to help us build for ourselves on the surface, the wondrous type of life they have forged for themselves inside the Earth. “The day of their emergence to the surface will bring our liberation”. They will teach us how to forge for ourselves a golden age of love, prosperity for all, immortality, true brotherhood they have built for themselves eons ago in their underground paradises. But until we willingly move into harmlessness for all kingdoms of Earth, they will not come. Inside the Earth, the subterranean people live in houses that seem like very luxurious palaces comparing to ours on the surface. Wealth is unlimited for all. There is no money system, but a very effective barter system. There is no taxation of any kind, no I.R.S., no banking system, no credit card system, no realtors, no mortgage companies, no hospitals, no doctors because no one ever gets sick, no lawyers, no law enforcement officers, no labor unions, no prison nor mental institutions. There are no retirement homes because no one ever gets old, all can maintain perfect health, youth and vitality for thousands of years, until they chose to move into their next calling somewhere else. Everyone is given one of those palaces to live in when they reach adulthood or start a family of their own. No one ever has to buy anything. They can acquire anything they want just by going to their various distribution centers and get it, just by the asking. Food is distributed fresh and wholesome daily in various distribution centers and everyone takes what they need. The food is “free”, fresh, totally organic with a high concentration of life giving minerals, vitamins, enzymes, oxygen, etc. that keep their bodies in such outstanding conditions. They would never think of poisoning their foods with an endless list of toxic chemicals to enhance growing or before they eat it like we do here on the surface. They must really think we are suffering from some kind of insanity or we are very backward to poison our soil the way we do, pollute our water systems, then our food with the 10,000 various kinds of toxic chemicals the food industry uses to give our food a better look and a longer shelf life. Our food must looks almost like rat poison to them, and they told me that they would not consider eating it. No wonder most of us suffer from one kind of ailment or the other! In the subterranean cities, everyone works approximately 20 hours a week for the benefit of all. They are, for most, community projects oriented to keep the communities or cities running smoothly. All work is considered “equal” and “sacred”. On the same token, no one has to pay to acquire anything they want or need. Everything is free. Since their lives is absolutely stress free and they choose their work, everyone enjoys their work. All work is performed with love and with a high standard of excellence. They work in teams for most projects and since they are very harmonious among themselves, their work time is considered a lot of fun and very fulfilling. Everyone has a lot of free time to develop their own personal talents, their hobbies, their personal studies of interest and their favorite pass times. In the subterranean cities, people are mostly vegetarians. The Lemurians under Mt. Shasta are totally vegetarians. No one eats any other, including the animals. All animals are also vegetarians, including the lions, tigers, panthers, etc. Because there is not the violence of the killing of the animal kingdom underground, their land is pure and very blessed. In Telos, they need only seven acres of land to feed one and one half million Telosians. I could go on and on as to why people who live underground have no desire to live on the surface. Until our consciousness evolves in a more positive direction, or perhaps until we get out of our “diapers” and start acting like mature, evolved humans, honor the Earth and Her many kingdoms, until we become more responsible stewards for our Sacred Earth, our platform of evolution, and stop trashing Her body, until we stop killing each other and slaughtering our animals, we are continuing to be seen, not only by the various underground civilizations, but also by the numerous other inter-galactic civilizations, as primitive, unreliable, unpredictable and not safe to be around. Need I say more? Myself, if I could move underground today and partake the kind of life the people enjoy inside the Earth, I would do so without hesitation and without regret. I also know the many who would come with me in a moment, so much are we longing for peace and true brotherhood. Wake up, people of Earth´s surface. Together, let´s all join hands to create for ourselves this wondrous paradise all of us have been longing for, for so very long. Today, let us all embrace harmlessness, kindness, love, compassion, brotherhood, forgiveness for each other, for all beings of the animal kingdom, and for all of Earth´s other kingdoms. Let us start to do it right now, and in each moment of every day to come. Let us create a new beginning and prove ourselves worthy and ready to be physically trained by our “underground” brothers and sisters. Let us join with them in spirit in our daily prayers, and soon in bodies, that together, we can forge a new civilization of human beings on this planet who will equal the attainment and mastery that our brothers and sisters living underground have reached. Let us do it…now and know that if we all bind together to do it, very quickly, our two civilizations will unite again “physically”, in a grand celebration of Love and Light.